For those looking to experience the rain forests and highlands of Cambodia the Mondulkiri Province is a must see place to include on your itinerary. 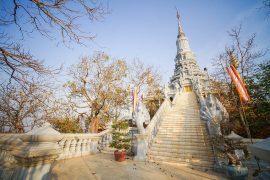 Located approximately 5 hours drive to the north east of Phnom Penh, it also offers respite from the tropical heat and the nights can actually be quite chilly so pack some warmer clothing. 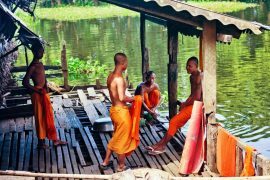 Although the largest province in Cambodia it is also the most sparsely populated being home to the hardy Bunong people. It is a place of mystery with the potential to see wild animals such as bears, leopards and elephants. Hidden within the beautiful rain forests are amazing waterfalls and there are a number of options for trekking both for single days and extended periods. No trip to Mondulkiri would be complete without a visit to the Elephant Valley Project where you can observe elephants in their natural habitat and interact in a sustainable way. Green Cultural Travel also recommends you visit the Romnea and Pu Long waterfalls along with the SEIMA protected forest which is a vast 3000km2 area rich in diversity. A visit to Phnom Dos Kromom mountains and the Mondulkiri Ethnic Project is also a must do. The Mondulkiri Ethnic project will give you an insight into the culture of the Bunong people as well as help to assist in the protection and rehabilitation of domesticated elephants. The provincial capital of Mondulkiri is Sen Monorom, a small village with a population of around 8000. Accommodation choices are limited and our preferred place to stay is Nature Lodge. It’s a family friendly resort featuring simple bungalow accommodation set in a natural landscape environment. The area around Sen Monorom is peppered with minority villages and picturesque waterfalls. We also recommend you visit a coffee plantation as Mondulkiri coffee has a good reputation with Cambodia locals although it is an acquired taste for tourists. The best time to visit Mondulkiri is after the rainy season from October onwards. The landscape is a lush green and the waterfalls are impressive. During the rainy season some area’s become difficult to access because a lot of roads are unsealed. If you are a nature lover, want to interact with elephants, if you want to discover an authentic Cambodia then you have to go, you will not be disappointed! Talk to a Green Cultural Travel advisor to plan either a guided or self-guided tour of this amazing province.